Most state CTE offices are required to use a number of logos on departmental documents (i.e. Career Education, Department of Education, etc.). While state CTE staff have expressed approval of the CTE: Learning that works for America logo, many of them are having a hard time balancing their use of multiple logos. Some states are working to turn the issue into a positive situation by viewing it as an opportunity to co-brand. Those states that are taking the co-branding approach believe that each of the entities they represent is strengthened by an association with each other. Other states have taken the approach that the logos they use on resources should be the result of careful consideration about which audience(s) the resources are targeted to help. The Arkansas Department of Career Education requires that all resources include both the Arkansas Career Education logo and the CTE: Learning that works for Arkansas logo. They have made a conscious effort to co-brand resources to demonstrate that CTE and the Career Education Department work together and are supportive of each other. Wisconsin’s Department of Public Instruction (DPI) has experienced some sensitivity about when to use the CTE logo and when to use the Wisconsin DPI logo. State leaders have expressed a concern that placing the CTE: Learning that works for Wisconsin logo on a document creates the impression that the document is owned by or distributed by CTE (instead of the DPI). State leaders have tried to be very purposeful about when they use each of the logos. First, they discuss who the intended audience is and how the document should be branded. 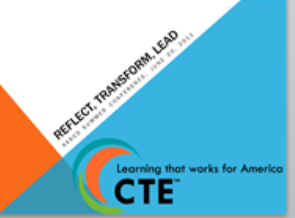 If the document is primarily to share the message of CTE, state leaders use the CTE logo. They have refrained so far from using the CTE logo on the departmental website because the message is broader than CTE. These sample resources demonstrate the thoughtful way that Wisconsin state leaders have chosen to address this issue. Whatever your state’s requirements regarding logo usage are, you have an opportunity to use multiple logos to communicate a message that CTE works for and with other agencies and departments. Be proactive about co-branding the CTE logo with other logos; it makes a clear statement of partnership and support.